“The addition was made to address concerns raised by some military groups,” a spokeswoman for Sen. Sam Brownback said today. WASHINGTON -- A Senate proposal to exempt car dealers from oversight by a proposed consumer protection agency has been changed to add a requirement that military families' complaints about dealers be monitored and shared by the new agency. Under the new proposal, filed late yesterday by Sen. Sam Brownback, R-Kan., the proposed agency's military liaison office would coordinate with the federal agencies that now oversee dealers to ensure that these complaints are addressed. But under the Brownback plan, investigations of these complaints and the devising of rules affecting dealers would remain with the current oversight agencies -- the Federal Reserve and Federal Trade Commission. “The addition was made to address concerns raised by some military groups,” Brownback spokeswoman Becky Ogilvie said today. The Military Officers Association of America, which has opposed the Brownback amendment, said it continues to do so even after the change. 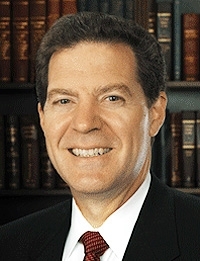 "Senator Brownback’s change fails to provide any additional protections for servicemembers and their families from unscrupulous dealers and places responsibility directly onto the troop to identify fraud and avoid being taken advantage of," said association spokesman Michael F. Hayden, a retired Air Force colonel. The Brownback proposal -- an amendment to the sweeping financial regulation bill now before the Senate -- could be debated and voted on as early as late tomorrow, Wood said. The Senate vote on the amendment is expected to be close, and it is unclear how many votes will be swayed by the changes. The U.S. Treasury Department has been leading a coalition of military, banking, consumer and civil rights groups against the Brownback amendment. The agency declined to comment today. A press conference on the new amendment has been scheduled for tomorrow by Brownback, NADA, the American International Automobile Dealers Association and the National Association of Minority Automobile Dealers as the groups' lobbying continues. “Dealers will make the case that unnecessary, burdensome and overreaching rules will only limit auto finance options and hurt the consumers which the new agency is seeking to protect,” NADA said in a statement. President Barack Obama spoke out against the Brownback amendment last week. Secretary of the Army John McHugh also expressed concern about the Brownback amendment last week. “Over the years, many of our soldiers have fallen victim to predatory lending practices and have entered into contracts for prohibitively expensive financial products promoted by some unscrupulous car dealerships and lenders,” McHugh said May 12. The House passed a financial regulation bill that contains an exemption for dealers from oversight by the new consumer protection agency. If the Senate were to pass its measure without the Brownback exemption, differences in the two bills would have to be resolved in a conference of congressional leaders.